Full disclosure – Minecraft the video game is something that I’ve never played, probably due to my age. Having two boys of my own however, has meant I’ve put up with the intensely irritating thwack thwack thwack sounds as they’ve built their own worlds and lost countless hours of their childhood to it. Visually I suppose I never really got it. Here we are on next gen consoles playing a game that looks like it was thrown up in the early 90’s – yet it’s a global phenomena, and that can’t be wrong can it? 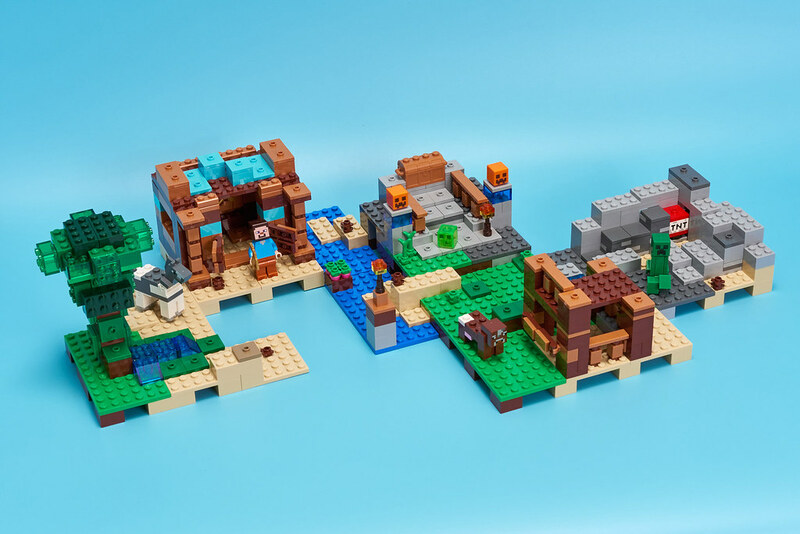 Of course the good thing with Minecraft is that it’s all about building, creating and sharing – and that translates to the world of LEGO very nicely. To date there have been 28 Minecraft sets, plus a couple of minifigure packs, so it’s a license that is obviously working well. For this review I’ll be looking at 21135 The Crafting Box 2.0 which was released a few months ago. I’m not really expecting much for the AFOL here, so I’ll be building this with my inner child leading the way. Let’s get crafting to see if I’m proved wrong. It’s a medium size box, measuring 48 x 28 x 7.5cm with thumb press openers. It feels nice and weighty at 1.4kg, so being handed this as a wrapped up present would fill the recipient with glee and anticipation I’m sure. Despite using brown as a main colour it looks pretty good. The box demonstrates that this is not just one build, but a box of many and shows the various options and possible arrangements of them. There is some small print for the unwary – a disclaimer stating that all the models cannot be built simultaneously. Opening it up we find 5 numbered bags and a corresponding manual per bag. Interesting to note that the manuals on their own total 467g in weight – so nearly a third of the whole thing! Still, at least there are no stickers. Each manual shows three possible builds, so there is variety to be had and decisions to be made. With no set combination of how to put all 5 modules together it encourages creative freedom from the start. Well there’s nothing amazing in here – less so in the singles format that I’d usually photograph for a review. Let’s then have a group shot of all things Minecraft and narrate each point. You get Steve again, but with Dark Orange legs, a Creeper, a Slime, some pumpkin heads, TNT and a crafting table. The brick built animals are my favourite. There is a cow and a grey/white horse. I believe the horse head is a recolour exclusive to this set (currently). The horse’s hooves in Light Bluish Gray have only been seen in the Saturn Rocket before and Steve’s pickaxe gets a recolour in Pearl Gold. For this review I originally built two of the three options from each bag to get an idea of whether some builds are weaker than others. But after doing that, I thought why stop there? Each module takes only around 15-20 minutes build time, so I decided to cover all three and add in the extra text and pictures. There’s nothing like being thorough eh? I’ve tried to keep it as pictorial as possible so you can really see what you get for your money. The designers have put a lot of thought into maxing out each build from the number of bricks provided. I only had a couple of pieces left over per module, plus the usual small spares. Because of the 3 in 1 nature of each bag, there can be a few things that come across as a little odd – such as using 8 1×1 plates where a 2×4 plate would normally go, but that’s the most extreme example I came across. Each bag has it’s own theme and colour palette – some a bit blander than others – but it makes a good mix when all the modules are placed together. Let’s delve in at the beginning. The first bag contains Steve. Option 1 gives us his house, a tower is option 2, and a bridge is option 3. Here’s Steve’s House. The crafting table is inside it, and there is a place on the wall for either the sword or pick axe to hang. It features swing doors and the roof also comes off for easy play access. Here’s option 2, The Tower, which works really well as a centrepiece in a layout. Option 3, The Bridge, has a functional element – a manually operated step that moves from one side to the other which is a nice little play feature. Steve can stand atop and block foes from passing. The options in this bag are all quite varied. So far so good. The second bag gives us the horse mini-build, and the theme is a desert/oasis landscape. Here’s the first – some kind of tree, with water for your trusty steed and some sand. And the second option with scrubland, cacti and lava. I think the cacti are instantly recognisable – quite a success given the blocky nature of the set. Option 3 is more of the same. So not a lot of variation within this bag, but as terrain they all look perfectly fine. Mining! Explosions! Every kid (and many grown ups) like exploding stuff and it’s good to see a functional element included in one bag that lets you do just this. All 3 options feature some kind of mechanism to interact with. Bag 3 also contains a Creeper. Option 1 gives us the best TNT experience, and purely in the interests of investigative journalism I gave it a thorough testing to make sure it functioned as it should. Here’s how it looks from a front angle. Spin it around to see the red lever of doom. It flips a small technic beam on an axle. Let’s see if it works…. Oh yes! And after blasting the TNT, some Redstone is revealed within the wall. It’s all rather simple – the blocks sit on 2×2 jumpers so they ping off really easily. Want to take out a Creeper while you’re there? No problem! Option 2 is not quite as explosive. You get a nice tall build and the mechanism is designed to push blocks out of a stack one by one. The TNT is quite well hidden though. Each time one block comes out, the stack drops. You can keep pressing the mechanism until all the blocks have been used. In practice I found the blocks don’t always drop perfectly – they can sometimes stick between the two tiles holding them in place. Making sure all the wall bricks are perfectly pressed home seems to improve this though. Option 3 looks promising and the function in this one works fine. It’s just not quite as satisfying as the first build because the blocks and TNT are all on one plate. Even so, levers and TNT are an irresistible combination. What’s not to like about bag 3? This one is all about rearing livestock, so we have the cute cow mini-build. It’s probably the dullest module visually as it consists of mostly browns and dark oranges, yet offers more play than the simple terrains of bag 2. Option 1 gives us a small cowshed with gates on it. The roof comes off for easy access to your brown bovine – probably a good thing as it does look a little claustrophobic with it in place. I almost felt sorry for her. Option 2 is a gated enclosure with some running water. I think it looks better than the first as it is open and airy. Option 3 reminds me of a ranch entrance. It’s therefore probably best used with another module placed directly behind it. The last theme is supposedly about growing crops, though not being a player of the game, I don’t entirely get all of the builds. It’s the most colourful out of all the different bags and includes a Slime. Option 1 has steps leading up to a chest full of what could be gold nuggets or wheat seeds. I had to question my son about this build but he wasn’t entirely sure on how it fitted the bag theme either. He just told me it’s a player built structure and looked at me as if I was an idiot. However, it’s visually interesting as there are a good mix of elements. The slight increase in height also helps to contrast between the flatlands of other modules – useful when joining them all together. There’s beetroot, carrot tops, pumpkin heads and a couple of lanterns. Option 2 is a type of entrance behind which Steve can find a chest of goodies. Option 3 is the most suited for growing your crops and pumpkins I think. Considering this is made from all the same bricks as the entrance above but in a different order, it just looks so much better. It’s certainly the option that appealed to me most – and Steve looks happy gardening. Having dealt with all the different modules and some of the options within, how do we go about putting them all together? Well there’s no specific way, though each one has a few logical areas to use for attaching to each other. Throughout the bags there are extra 2×4 bricks in Dark Tan specifically to assist with this. In practice, I found there are still a few limitations on what works and what doesn’t, especially if you want to explode things a lot and have easy access to gates etc. Here’s all the option 1’s joined together in a close arrangement. And then spread in a more linear fashion. Then some of the alternate builds. With 5 modules and 3 builds in each, the permutations of layouts using the default instructions alone is sizeable. There is a beauty to the simplicity of it too. The number of bricks per module is not overwhelming – so they’re dead easy to take apart and rebuild in a different fashion. Because they have short build times, you can re-invent your layouts again and again quickly – and that adds to the play value. Start building your own modules and you’ve got a set that keeps giving. The previous 21116 Crafting Box was an 8 in 1 build with 518 pieces, This, in reality, is more of the same but with a slightly different spin and a higher piece count (and price). Having not built the previous incarnation, unfortunately I cannot do a direct head-to-head comparison. Even so, it appears to be a pretty good follow up. No review is complete without a bit of price analysis so let’s look at that. There’s only 717 pieces and as it’s a licensed set I’d expect it to have some kind of premium. The RRP in the UK is £79.99 but considering the US price is $59.99, a mere £46 at todays exchange rate, there is one word that springs to mind – outrageous! I appreciate that there are sales taxes to be added in the US, but still, that is a massive difference. Euro price in Germany is €69.99 – around £62 and France is €74.99 – around £67. It almost makes the US RRP look under-priced. Fortunately as the set has been out for a few months, and is stocked by all the major retailers we can find a few discounts already. At time of writing it’s 25% off at Amazon.co.uk for £59.99 so that’s the figure you should be shooting for at most – it’s actually been lower than that. Despite the set’s basic appearance, it does offer a lot of play value, and that’s the sort of thing that is hard to put an exact price on. So going back to my original line of thinking – what’s in it for the AFOL? Well, I still don’t think a great deal. You’d really need to be a Minecraft fanatic or theme completist to get it – but that’s not to say this is a bad set by any means no no no. It’s actually very good and achieves what it sets out to do perfectly. I have no complaints there. In many ways it has more opportunities for longevity than similarly priced sets in other themes. Even with little experience of this theme (I only own the Skin Packs) it’s still been an enjoyable little set to build and for the target demographic I think it’s perfect. If you’re an AFOL with kids, this might be a good one to have in mind for buying them. It’s a great all rounder and should provide hours of play – and the good thing about Minecraft is how well all the different sets work together. It’s also easy to integrate your own MOC builds from the most basic of brick collections or reconfigure the modules supplied. Now I’m understanding why the PAB walls at brand stores always seem to have Reddish Brown 2×4 bricks and Bright Green plates on them. Many thanks to the LEGO Group for providing Brickset with a review copy of the set. All opinions expressed in this review are my own.